Juniper berry essential oil is derived from the berry-like seed cones of Juniperus communis, which belongs to the Cupressaceae family. The genus Juniper is divided into at least two subspecies with frequent intermediates which can vary in habit from a low, spreading bush to a small columnar, single stemmed tree. Since ancient times juniper has been an important spice in numerous European cuisines, and particularly where it grows abundantly such as throughout the Alpine regions. Today, the berries and its essential oil is used to flavour a wide range of foods such as sauerkraut, stuffings, vegetable pates, and beverages such as tea and of course most famously, gin. Depending upon the geographical variety, the bushy juniper shrub can attain a height anywhere between 1 and 3 metres (3-10 ft), and the columnar tree occasionally reaches a height of 10m (33 ft). The smaller prostrate form ‘horizontalis’ is native to north-east America and the taller variety ‘erecta’ is very common throughout Europe. The slow growing evergreen juniper tree has slender, smooth twigs with needle-like leaves arranged in whorls of 3. It bears small berry-like cones, about 1 centimetre in diameter with leathery scales which are green when young. The berries require up to 3 growing seasons to mature, at which time they begin to turn a dark blue colour. At all stages of development they are covered with a white bloom. Native to Asia, Canada, northern Europe, Scandinavia and Siberia, Juniperus communis is cultivated for the production of juniper berry essential oil mainly in Austria, Canada, Czechoslovakia, France, Hungary, India, and Italy. Juniper berries, together with its leaves and branches have been used since ancient times when the plant was believed to possess the power to ward off evil spirits, negative forces and illnesses. These parts were also used for cleansing and purifying the mind, body and spirit. Juniper branches and berries were burned in Sumeria and Babylonia as a sacrifice to the gods and considered sacred to the Sumerian goddess Inanna and her successor, the Semitic goddess Ishtar. In ancient Egypt and Tibet, juniper was highly prized as a medicine and as an ingredient in religious incense. A remedy to treat tapeworms was discovered in Egypt on a papyrus which dated back to 1550 BC. Since that time, the indigenous peoples of many cultures have used juniper to treat a wide range of conditions including urinary infections, respiratory conditions as well as arthritic and rheumatic conditions. In Europe and Asia the needles and berries were used to make tonics for kidney and stomach ailments, and native Americans from the Pacific Northwest used tonics made from the branches to treat colds, flu, arthritis, muscle aches, and kidney problems. 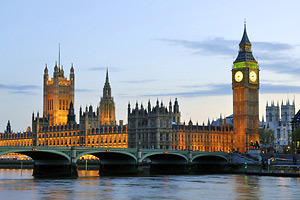 In fact, juniper berry remains in the British Herbal Pharmacopoeia to this day. 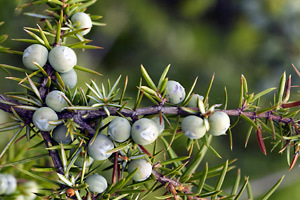 Juniper berries take two or three years to ripen, so both unripe green berries and the mature dark blue ones can occur on the plant at the same time. The ripe juniper berries are still collected in a time honoured way which has changed little over the centuries. In autumn, the harvesters carefully beat the branches of the bush with sticks, until the ripe berries fall into collecting baskets or sheets placed underneath the bush. The unripe berries that are still green will remain on the branches, and may be collected the following year if they have sufficiently matured. The harvested berries are spread out in thin layers to dry slowly in the shade and great care is taken to prevent fermentation which occurs easily when the fresh berries are stored in sacks. Damaged or fermented berries must be sold at a discount since they present a poor appearance and have an inferior fragrance and flavour. After drying, the berries turn the familiar blue-black colour. Juniper berry essential oil is obtained by means of steam distillation of the berries, and it has a rich, fresh coniferous odour with a faint ‘fruitiness’ and balsamic backnote. The essential oil derived from juniper needles and twigs does not have the rich fullness of fragrance as the berries, and has a harsher, pine-like aroma. Although juniper berry essential oil is a little more expensive than that derived from the needles, it is far more effective in aromatherapy and therefore you actually use much less of it in your treatments. This makes it work out no more expensive than the needle oil in the long run, plus it smells much nicer too! Juniper berry is a stimulating essential oil with an unsurpassed cleansing and purifying action, which makes it effective in the fight against cellulite and water retention. To benefit from its diuretic action, blend it with sweet fennel, cypress and grapefruit essential oils and massage the affected area. For the best results, treat twice daily with combinations of massage and baths. The cleansing action of juniper oil can also be utilised to great effect with arthritis, rheumatism and gout, since it encourages the elimination of uric acid which is a contributing factor with these diseases. Massage is the most effective method of treatment for these conditions because it stimulates the circulation, although the oil can also be used effectively in both warm compresses and baths. Juniper also has a mild analgesic effect which helps to ease general muscular aches and pains. Traditionally known to have an affinity to the urino-genital tract, juniper berry essential oil still remains many therapists first choice for the treatment of cystitis. At home it can be used in a douche or a hip bath, as well as massaged onto the abdomen. Of course if symptoms persist you should see your doctor rather than treat it yourself. Problem skin conditions such as acne, dermatitis and weeping eczema respond very well to juniper berry essential oil, where it imparts an antiseptic, astringent and soothing action. Used in a carrier lotion juniper berry is helpful with seborrhea of the scalp, and in creams and lotions it is a tonic for dull, oily and congested skin. Juniper berry oil is an effective neurotonic which can help with cases of stress, anxiety and general burn-out. Its overall effect on the emotional system is one of strengthening and cleansing, helping to dispel negative emotions such as insecurity, loneliness, sadness and guilt. 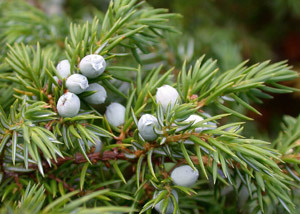 Despite its unfortunate and incorrect reputation as an abortificient, juniper berry is a versatile, stimulating and strengthening essential oil which brings a wide range of therapeutic benefits to aromatherapy. 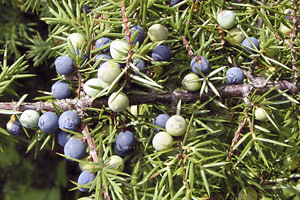 Juniper berry is the only example of a spice within the botanical family of Coniferae. It is also one of the few examples of a spice from a cold climatic region. 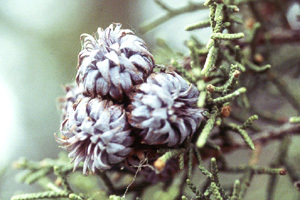 Top: Juvenile berries that still display their cone-like appearance with a white bloom. Centre: Fully formed berries, just beginning to ripen. Bottom: A mixture of unripe berries and the mature ones that will soon to be ready for harvesting. 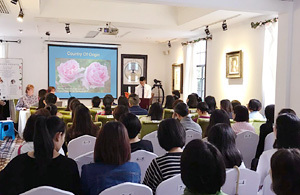 Most aromatherapy books incorrectly contraindicate Juniperus communis with pregnancy, alleging it to be an abortifacient and nephrotoxic. This is incorrect, and is due to older texts confusing it with another species of juniper known as Juniperus sabina, which is commonly known as Savin and is indeed an abortifacient. However, the older references to this species contraindicated its internal use in herbal preparations, not its external use in massage. Since juniper berry essential oil is a permitted flavouring in a wide range of drinks and food it seems highly unlikely that a diluted external application poses any serious threat to health. 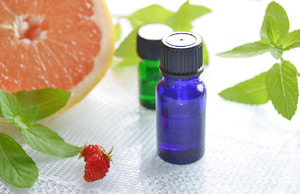 Learn more about the Aromatherapy Lexicon.